I’m only kidding, but it is a fascinating organism. Its complexity makes it difficult to pin down and also interesting to write about. But before we talk about why Plasmodium is such a pain, let’s first discuss what exactly makes an effective vaccine. As it turns out, Plasmodium messes with us on all of these fronts. The molecule you target must be necessary so that the microbe can’t mutate or get rid of it.Â For microbes like viruses this is a little easier to deduce because they have so few proteins and molecules that most of them end up being pretty important. One Plasmodium species on the other hand contains over 5,000 genes and we have no clue what most of them do. The molecule must be ubiquitous to make sure you don’t accidentally target only a subset of the microbes.Â When we talk about malaria, we are really talking about a disease that is cause by numerous different species of the single celled organism. This is in contrast to smallpox, for example. One bug. One disease. So that already complicates things. 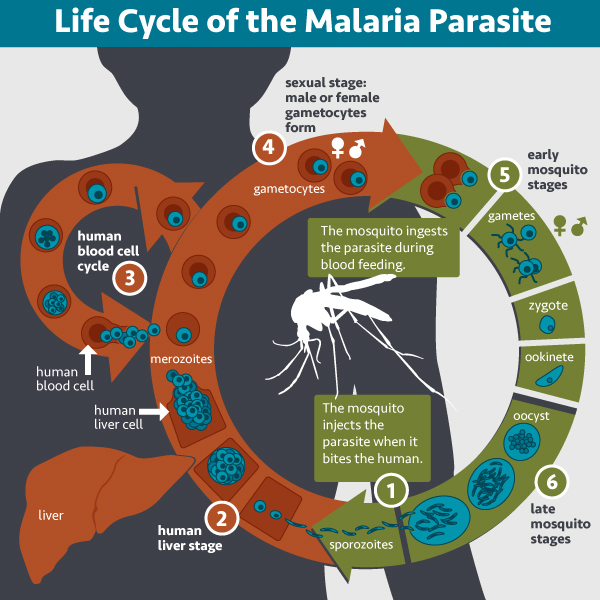 In addition these Plasmodium organisms go through a very complex life cycle and thus appear to us in numerous different forms throughout the course of one infection. So what target do you pick? There are very few things common to all the species of Plasmodium. And even within a species, the proteins in one stage of the life cycle probably aren’t going to be present in the next. The molecule must be “visible” to your immune system, because what’s the point if your immune system can’t find and identify the microbe. For most of its life cycle Plasmodium hides in our cells. While this isn’t great, our immune systems do have the ability to find and kill them but this requires a special kind of cell called a CD8+ T cell. Unfortunately, vaccines are notoriously bad at making CD8+ T cells. Plasmodium then undergoes exponential growth while hiding such that one microbe goes into a liver cell and ten thousand come out. So if you miss that one microbe hiding in a liver cell, you are kind of screwed.Â On top of that, Plasmodium species undergo a process called antigenic variation, during which they change what they look like entirely. I know I sound really doom and gloom with all of this, but I swear there is cause for hope. Today we know way more than we did even just a decade ago. At Emory, scientists led by Mary Galinski are gathering a huge amount of information on the the immune response to natural infection and vaccination. In the next two posts, I will explain why one advanced malaria vaccine is really more an incremental success, and I will describe effortsÂ byÂ Alberto Moreno and colleagues to developÂ a multistage vaccine.